Moving Iron Instruments are generally used for measuring AC Voltages and Currents. These are repulsion type moving iron system having high torque to weight ratio. Instruments are highly damped with best jewel bearings, incorporated with hardened and precisely polished pivots and chemically treated hair springs for corrosion protection. An efficient system of fluid damping is employed. The movement is efficiently shielded against the effect of external magnetic fields. Moving Iron Meter of 90 degree Deflection with Fixed/Interchangeable Scale Facility. Movement Type : Moving Iron type with Jewel Bearing Suspension. 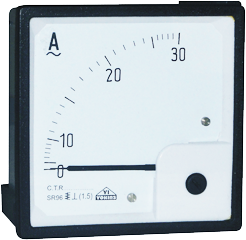 Range : Current (A) : 0 - 1A to 0 - 100A (Direct), Through CT/1A or /5A for Higher Currents and suppressed scale meters with ratio of maximum 1:6. Voltage (V) : 0 - 10V to 0 - 750V (Direct), Through PT for Higher Voltages. Size : 48x48mm , 72x72mm , 96x96mm , 144x144mm. Accuracy : ±1.5% of Full Scale for all except SR48. ±2.5% of Full Scale for SR48.